You may have seen my post on updating my teenage son's bedroom. If you did, you will know that I had some ugly roman blinds to deal with. They were beige and stripy and not very attractive at all, especially with the colour scheme I had in mind so I had to figure out a way to update them without taking them down and remaking them (we live in a rental so I couldn't remake them). I came up with a sneaky plan to cover the roman blinds with new fabric in a temporary manner so that when we leave this house we can take them with us. I didn't wrap mind all the way around and I wish I had. I measured the blind (width and height). I added 10cm to the top and bottom - my blind measured 110cm high so I cut the fabric at 130cm. 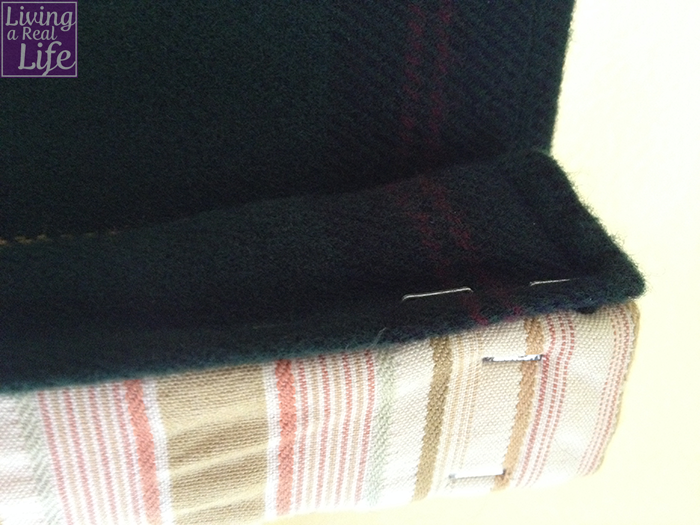 I added 4cm to the width (2cm per side) - my blind measured 110cm wide so I cut the fabric at 114cm. I hemmed the blind all the way around with a 2cm hem. Now my hemmed ,blind measured 126cm high by 110 wide. Next I stapled the fabric onto the top of the blind (make sure you don't put the staples in too hard if, like me, this is going to be temporary). Smooth the fabric down the blind, wrap the fabric around the lower batten and staple it, ensuring that you use all the spare fabric.